Terry Readdick was born in Brunswick, Georgia. After graduation from Glynn Academy, he attended Georgia Tech and obtained the degree of Bachelor of Science in Industrial Management, in 1971. He then attended the University of Georgia Law School and graduated in 1974. In law school, he was the principal oralist on the National Moot Court Team, which won the Southeastern Regional Competition and participated in the National Finals. He was also a member of the International Law Moot Court Team, and as a result of those activities, was elected to the Order of Barristers. In the summer of 1973, he obtained a Certificate in an international study program at The Hague, the Netherlands. After graduation from law school, he returned to Brunswick in 1974 and practiced for four years with Taylor, Bishop & Lee, a partnership consisting of A. Blenn Taylor, Jr., James A. Bishop, and Thomas J. Lee. In 1978, he joined the firm of Dickey, Whelchel, Miles & Brown, which has now evolved to Brown, Readdick, Bumgartner, Carter, Strickland & Watkins. For approximately the last ten years, Mr. Readdick has served as a mediator in numerous types of civil cases. 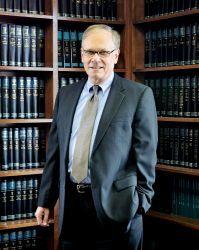 In January 2014, he retired from the active practice of law and now devotes his practice entirely to mediation and arbitration. He is certified as both a mediator and arbitrator by the Georgia Office of Dispute Resolution. He has extensive experience in local government representation, employment law, contract and general business disputes, and personal injury and negligence cases (both plaintiff and defense). He has represented approximately forty cities and counties in South Georgia in a variety of employment, civil rights and other issues. He is a Fellow of the American College of Trial Lawyers and a member of the Georgia Bar Association. Mr. Readdick has served as Chair of the Investigative Panel of the State Bar of Georgia, which investigates and responds to grievances filed against attorneys, and as a member of the Court Advisory Committee for the United States District Court for the Southern District of Georgia. He is an avid classical pianist, and has regularly performed in the Golden Isles area. He has been involved in many local and state arts organizations, and is a past-president of the Glynn County Mozart Society, and the Golden Isles Chamber Music Festival. He lives on St. Simons Island, with his wife, Jenifer.